Priced per piece, sold in quantities of 5 with 5 piece minimum. Please order in quantities of 5. Silicon carbide abrasive provides better cut rates and finishes and last longer than traditional emery sheets. Available in 12 grits. All Silicon Carbide. Each sheet measures 9" x 11". 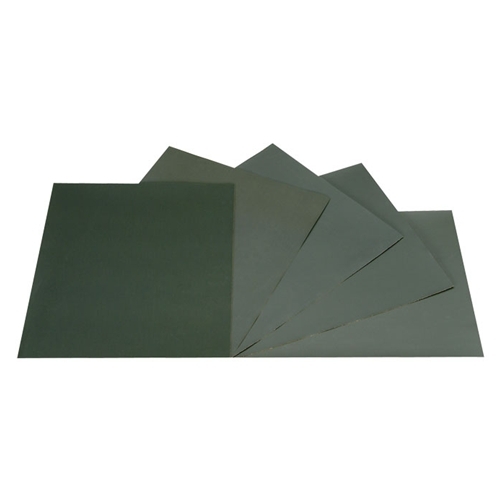 Coarser grits (80, 120, 180) are backed with 431Q heavyweight paper. Medium and fine grits (220, 280, 320, 400, 600) are backed with 413Q lightweight paper. Finest grits (1000, 1500, 2000 and 2500) are on 401Q flexible papers. Sold in quantities of 5.